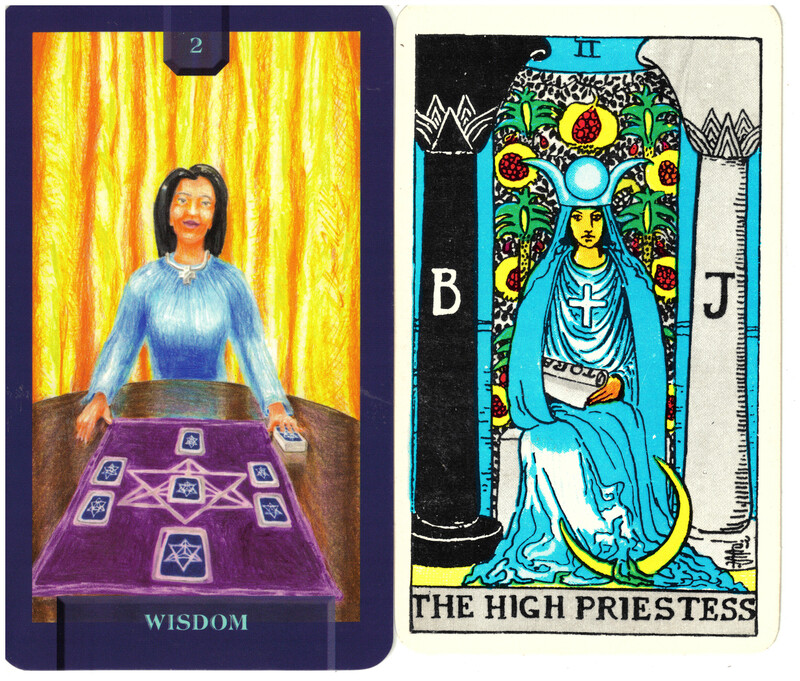 The High Priestess is one of the most esoteric and symbolic cards in the Major Arcana. That is because she represents the seat of symbology, the subconscious mind. She is a link between the seen and unseen worlds. In the Rider/Waite/Smith deck the scroll on her lap contains the secrets of the ages. She is a teacher with much wisdom to share. The symbols in this card include the pillars on each side of her, the moon and feminine principle and the cross on her robe. Today’s Journey Tarot changed this card to simply Wisdom. Key 2 shows a Tarot reader consulting her cards. The Tarot is also a book, just like the scroll in The High Priestess card and it too contains all knowledge and wisdom. For Expanding Dimensions it was the obvious representation of this principle. But the wisdom still remains secret to those who do not seek to understand, which is why the cards remain face down. The reader has the knowledge to reveal the hidden meaning.